In the Best, we Trust! You are totally free! No need to have your fleet displayed in Sedna to use our CICO Webapp: hurry and give it a try! Get a higher boat quality control, a higher customer quality service, a faster claim management with the CICO Webapp: all data you need during the check-in/check-out process, including those crucial for security & warranty reason, (such as boat pictures, “damage” photos, e-notes) are filled in in real-time by your clients at peer. Set up your own Items Categories and Library. They will appear on your WebApp. Each Check-In will be fast and well organised! Sedna offers the ability to sign directly on your tablet for you to gain time and efficiency! Take pictures with your tablet and insert them in the WebApp to visually record what you need! When the Check-In is done, Sedna offers you the ability to send the screenshot to your client: he surely will appreciate that a lot! 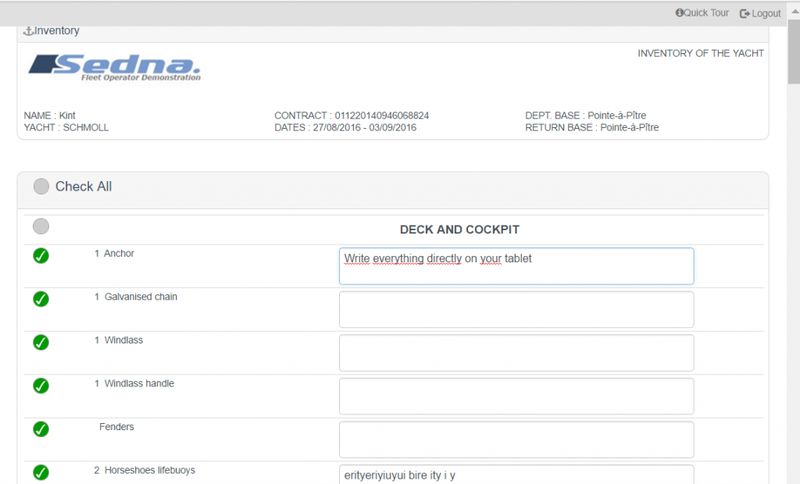 Your clients can check each part of the boat and point out any problem by writing directly on the tablet. This feature enables to draw or write directly on the boat pictures to visually highlight any problem or remark. Sedna offers your client the ability to sign directly on the tablet for both of you to gain time and efficiency! When the Acceptance check is done, Sedna offers you the ability to send the screenshot to your client: he surely will appreciate that a lot! Each Check-Out will be fast and well organised with the Items List to check and the ability to write a comment for each item! This feature enables to draw or write directly on the tablet to highlight any problem or remark. Sedna offers the ability to sign directly on the tablet for both of you to gain time and efficiency! Having the Satisfaction Survey directly on the WebApp helps you increase the response rate and so improve your Customer Service. Minimal Installation Fees! 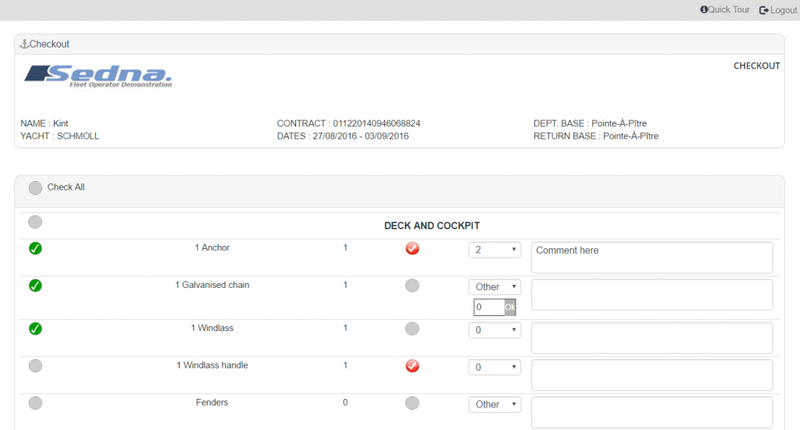 Depending on the Fleet size, Sedna may charge a minimal Installation Fees to set up the Fleet in the WebApp Back-Office. Customization Requests! As you know, Sedna is “à la carte” which means that we are flexible and willing to always match our products with your specific needs at additional customization fees. Get the Best out of your Business! Contact usDrop a line to us! or Purchase nowWelcome to our world! Copyright © 2014 Proce2.net SAS. All rights reserved.